LinkedIn has one of the most robust user-powered social search engines with over 400M users worldwide. LinkedIn is the place to turn to for business-to-business (B2B) networking, buying and selling. If you are a seller, hiring manager or applicant, it’s critical to optimize your LinkedIn profile to improve your ranking in LinkedIn search results. Social media, especially online professional networks (e.g., LinkedIn), play a vital role for senior executives making company purchase decision at B2B companies according to IDC. Furthermore, IDC found that 50% of the purchase process is complete before a salesperson becomes involved. That means buyers are spending time up front doing research on LinkedIn. According to LinkedIn, half of all their users are likely to buy from a company they engage with on the platform. Steve Degener, a small business B2B online trainer in the retail sector, knows the importance of being found in LinkedIn Search. LinkedIn continues to be a very important communication tool for our business. We use it to connect with industry peers and drive interest to our online courses for Loss Prevention and Human Resources. We rate the site as our top communication channel for the Loss Prevention Academy and WZ Academy. Just like with search engine optimization, there are certain ranking factors to consider when building out your LinkedIn Profile. These tips apply whether you are a seller, hiring manager or applicant. A ‘buyer’s’ journey begins with the LinkedIn Search or LinkedIn Advanced Search box that appears at the top of a profile page. 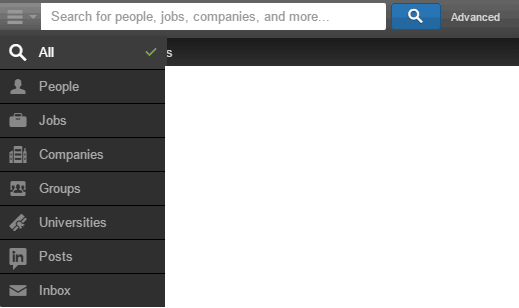 When you drop down the menu to the left of the box, you can choose to refine the search by only searching within those LinkedIn services. We’ll explore how to optimize the four key areas that can impact your ranking potential. Prospects, customers, vendors, and clients research you before they do business with you. Take the time to control what they discover about you and your brand. Make your LinkedIn profile your best personal branding tool. It starts with the headline. Before you get started, create a list of relevant keywords you want your company associated with. The secret for increasing traffic to your LinkedIn Profile is to apply effective Search Engine Optimization (SEO) techniques. The keywords should be relevant and intuitive. Meaning, what search terms will a prospect use to find you on LinkedIn? 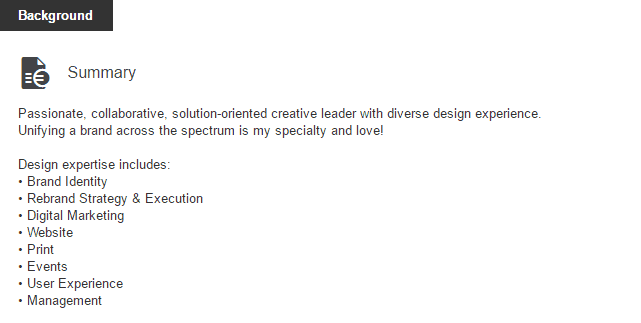 The typical profile headline reads like mine (did) – job title followed by company name. In my opinion, that is not very compelling. Think of how your profile will appear in LinkedIn search results. You want to stand out. 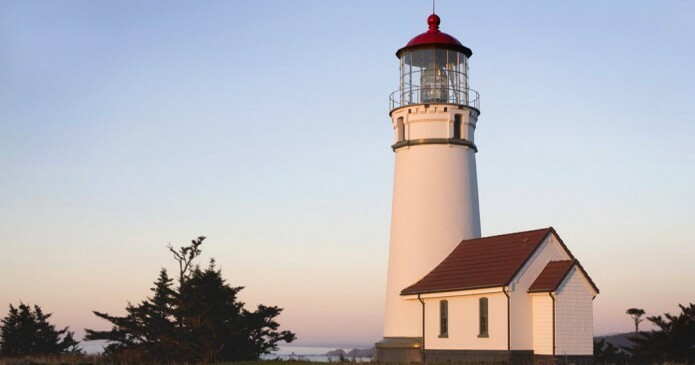 When crafting your headline, think benefits vs. features. a. Write a headline that includes a value proposition. Answer the question from the perspective of the person who is viewing your profile – What’s in it for me? b. Use power words and dynamic language. c. Include keyword(s) that will help people find you. In my case, ‘social media’. d. Treat it like a conversation starter. Show your personality (but don’t overdo it). Let’s get real for a second. Does your profile still look like you? Is it professional? Use a current professional profile picture. LinkedIn is not the place to use a casual snapshot. Profiles with a photo receive a 40% InMail response rate. 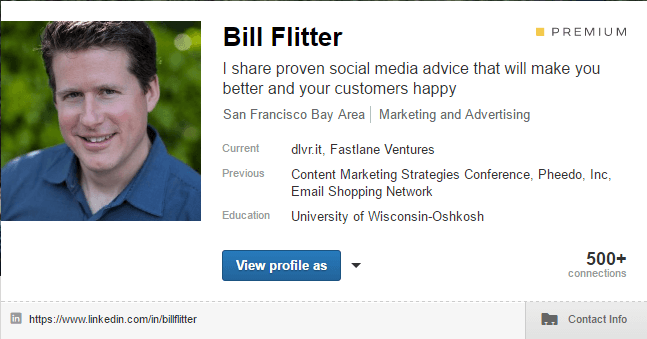 Your LinkedIn profile has 11x more chances to get viewed if you add your picture. Read this excellent study, my colleague, Debra put together on creating perfect profile pictures – filled with tips backed by research. To create a customer profile URL, follow the instructions from LinkedIn. You can enter up to 3 websites in your contact information section. Use attention grabbing keyword rich anchor text for your URLs. You can up to 30 characters. Entering relevant anchor text helps with crawling your LinkedIn profile (within LinkedIn). It also lets people know what your link is about. However, keep in mind that it DOES NOT pass along any link juice. Don’t count on these for valuable backlinks. Below are few examples of summaries from people spanning a few types of industries that follow the above tips. The LinkedIn search algorithm relies heavily on your network. The search results favor people you’re connected to (1st connections) and people they are connected to (2nd connections). The more people connected to you, the more likely you will show higher when someone is searching for what you offer. Pro tip: Accept invitations from everyone – within reason. As with all search engines and social networks, content is their fuel. LinkedIn is no different. BrightEdge conducted a broad analysis of the Top 100 brands on LinkedIn. They uncovered that 50% of the top 10 brands by recommendations also appear in the top 10 by # of monthly updates. Conclusion: With 5.7 billion professional oriented searches performed last year, it is important to approach LinkedIn from a search perspective – the same as you do Google. Share high-quality content that includes keywords on your LinkedIn company page. The goal here is to increase engagement. LinkedIn takes engagement of your company page into consideration when deciding where you rank in searches on their site. Linkedin provides tools that allow you to create targeted variations of Company Page updates — you can target based on company size, job function, industry, seniority, geography, and language. 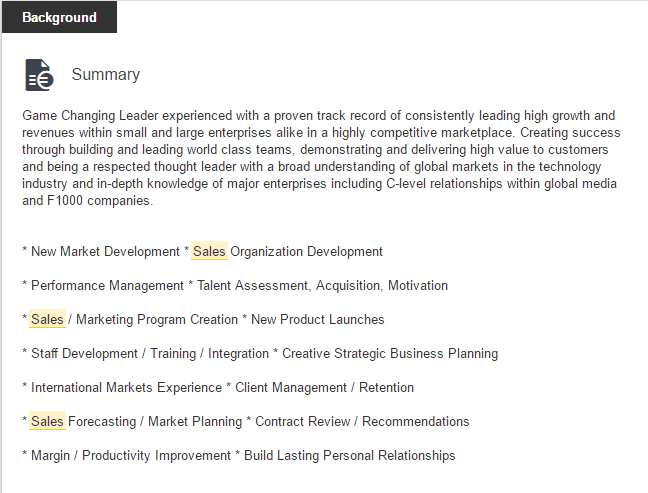 Take advantage of adding Showcase Pages to your LinkedIn Company Page. Showcase pages are an extension of your LinkedIn Company Page and allow you to highlight a particular service offering or brand. Showcase pages are another place for your targeted keywords. Conclusion: Think of this as landing page optimization. Don’t take a one sized fits all approach to your company page. Invest the time to share targeted content to your different customer types. Create Showcase page for each product or service offering. Have your employees associate your company with their profile and share relevant company updates in their personal feed. Unlike Facebook, LinkedIn is 100% business focused so sharing a company update is entirely appropriate. What’s the impact on your company page? BrightEdge found companies that have a greater proportion of their employees on LinkedIn had more followers on their company pages. In fact, nine out of the top ten brands with the most followers on LinkedIn, have at least 60% of their employees on LinkedIn. Conclusion: Active employees equal more LinkedIn company page followers. The more company page followers, the higher ranking in LinkedIn search results. Plus the more reach and potential interaction with your content. Remember from tip #2 above; engagement correlates into higher rankings. Along those same lines, learn how your employees can establish a drip marketing campaign in their personal LinkedIn feed. 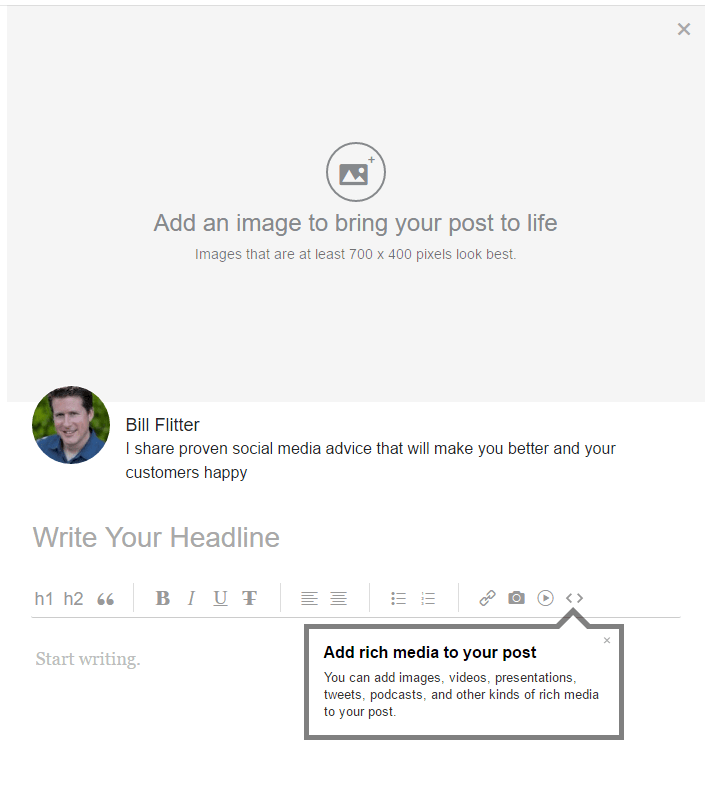 LinkedIn Pulse allows you to write long form posts on LinkedIn. In other words, it’s a blogging platform integrated within LinkedIn. One of the biggest benefits of LinkedIn Pulse is its built-in audience of over 200 million people. There are not too many secrets to reveal that you don’t know already if you are optimizing your blog for SEO and engagement. Take the same approach with Linkedin Pulse. 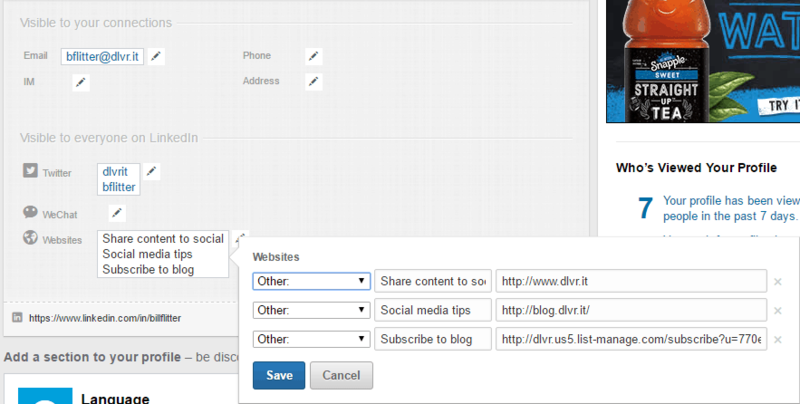 It is another place to distribute your existing content. Prospects can find you based on what you publish on LinkedIn. As you can see from the image below, it looks much like the editor in WordPress. LinkedIn offers several tips on the type of content that gets the most engagement. Not surprising, engagement is essential to boost search rankings within LinkedIn. What concrete advice would you give to someone hoping to enter your field? What else would you do if you started all over again and why? Challenges for the future of your profession. One of the more important aspects of Pulse is anyone can follow your posts – even if not connected to you. LinkedIn Groups are a powerful way to establish credibility in your niche. Sharing relevant and useful posts helps you build credibility for your content creators, your brand, and your content. You are tapping into a community that can give you feedback on topics and ideas you’re developing. It’s a no-brainer to join existing groups in your area. However, have you considered creating your own LinkedIn Group? People want to do business with experts in their fields. Plus your profile is highlighted in your group page. If your prospects find your group, this is a significant advantage. Plan. Create a plan for the group. What is your group’s mission? It’s easy for the group to lose focus without a plan. Focus. There are over 2 Million groups. To stand-out, create a group with a tightly focused niche audience. It’s about reaching the right audience – not just have the largest groups. For example, if you are an SEO company, maybe you start a group for a specific customer persona or category – SEO for Law Firms, for example. Invite. Use LinkedIn Search to find the exact target customer that might be interested in your group and invite them to your group. This invite allows you to get in front of a prospect without trying to sell them something. Boost their ego. Tell them you would love for them to offer their expertise in the group. Start building your relationship from there. Way the pros and cons of an invite only group. If it makes sense, don’t let anyone in that doesn’t fit the group’s focus. Engage. Add engaging content that starts a conversation. You want your group to be active. Optimize. Create a compelling title and description for your group that filled with your keywords. Search other groups to see questions and content your prospects are posting. Assuming you already posted a reply on the group, email content relevant to their question and conversation. LinkedIn is a robust platform that provides useful tools for marketers. There are plenty of ways to communicate to your target audience and establish credibility – Profile updates, LinkedIn Company and Showcase Pages, Pulse, and Groups. My advice is to participate in all of them to have complete coverage. It does take work to cultivate relationships on LinkedIn. However, if you are reaching a B2B audience, it is well worth the time. Complete Profile: Take the time to control what they discover about you and your brand. Revise Company Page: Pack the first 156 characters of your description with keyword-rich sentences. Schedule Content: LinkedIn shows the busiest time on LinkedIn is mornings and midday, Monday through Friday. 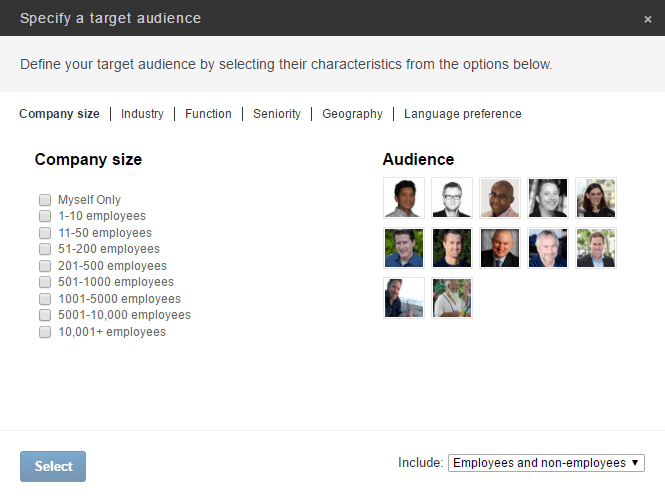 Reach the Right Audience: Go to your LinkedIn Company Page and click the “Analytics” tab. Here you can review best performing content, demographics and more. Keep it Social: Start conversions with prospects. Comment on updates. Follow-up on conversations started. Show off: Add your products and services as a showcase page on your company profile. Participate in Groups: Join groups or start your own. Have any LinkedIn search tips to share? We’d love your feedback. Please share in the comments. Facebook Messenger and the Rise of the Bot – Should You Care?